» Refactoring Demo: Is It More than Just Changing Stuff? A tool is not the same thing as a discipline. For example, Jenkins is not Continuous Integration. And just because you’re using Jenkins doesn’t mean you’re practicing CI. You may only be doing “CI Theatre“. I’m afraid the same is true of refactoring. Just because you use a menu item doesn’t mean you’re refactoring. You may only be doing Refactoring Theatre. So here’s a refactoring demo in a 12-minute screencast. 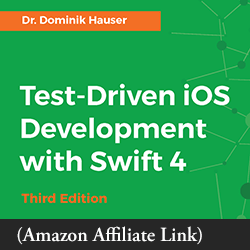 In my TDD sample app, I want to move a line of code into a class which doesn’t yet exist. Whenever I run unit tests, I call it out with a “ding” sound effect, and a text overlay in the upper-right corner. Watch how many times I run my unit tests, and how often. I hope my use of AppCode, and calling out the shortcuts I use, doesn’t detract from my message. I’m a big believer in having good tools and using them well. For me, that means I prefer AppCode, which is a keyboard-centric IDE. Despite the shortcuts I use in Xcode, it remains largely mouse-centric. My goal in this screencast is to pretend that we’re pair programming. That way you can see not just the end result, but the steps I take, and how. 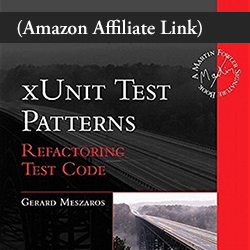 Do you have the Refactoring book? The Refactoring book completely changed the way I code. Don’t delay: Buy yourself a copy today! Have you seen this kind of refactoring in your workplace? Please share your experiences in the comments below. Just because you use a menu item doesn’t mean you’re refactoring. It may be Refactoring Theatre. I dislike Xcode’s Refactor menu item. Rename isn’t really refactoring. Extract is just moving code to another function. Those are so low-level. A much higher level thinking is required to architect an app properly, and refactor to improve code. But Rename Method and Extract Class are important refactorings. What I’m trying to show is the importance of small steps verified by unit tests. The goal is to minimize time “in red”. Wow, this is like “iterative refactoring”, which is a term I just made up :) I like the idea of refactoring so that the code still works every step of the way, instead of leaving things broken until the end. Thanks for the screencast and post, Jon! This was valuable for me. Glad you liked it, Vui. 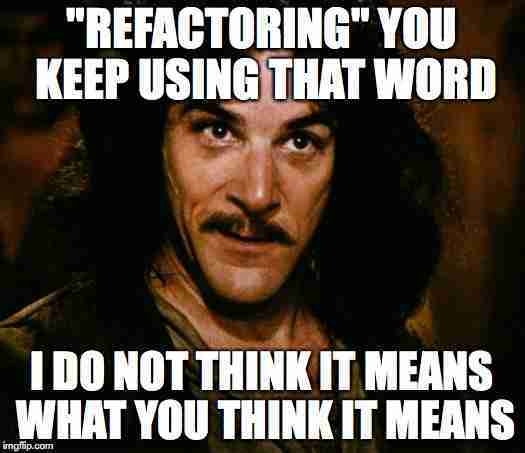 It’s unfortunate that the term “refactoring” has been so corrupted. So… welcome to “iterative refactoring”!